Wide range of Daylilies for sale, all shapes, colours and size. We would love to show you our living catalogue during bloom time, so why not pop over, enjoy a drink with us and peruse the collection in our tranquil garden. 10am to 5pm at weekends. Weekday afternoons 2pm to 5-30pm excluding Mondays. Or any time by appointment. Donations to our local hospice gratefully received. 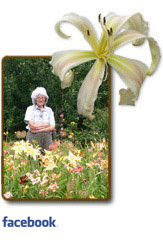 In 2004 I was honoured to be awarded the National Collection, (full status), of Spider and Unusual Form Daylilies, (Hemerocallis). It was my fascination with these particular daylilies which drove my compulsion to show other people how wonderful they are and thus made me apply to the NCCPG, (now Plant Heritage), to register myself as a holder of a National Collection. Many e-mails later I was visited by the county organiser and after filling in what seemed like an endless questionnaire, the paperwork was completed, the site was examined and I waited with baited breath. An illustrious garden visitor on hearing of our successful application told me at the time that “now the hard work starts”, and he was right. Still, it has been worth it and we have had many garden visitors since then who have come to see and it would seem really enjoy these wonderful daylilies. In 2004 there were 260 plants in the Collection, (from a total daylily display of just over 1,000). This now stands at well over 400, (from a total amazing display of over 1,500). My love of the exotic form daylily started with the stunning Lady Neva which is a great back of the border beauty. This, like the majority of the Collection is a tall, graceful form which is brilliant for placing in exotic plantings. As the love for more exotic and brighter gardens seems to have increased the love of the more exotic daylily has also increased. On the whole as I have said spider and unusual daylilies are much taller but the strong stems support the often huge blooms, (up to 12 inches across), very well so that they waft in the breeze and look great amongst tall grasses, in prairie plantings and also complement superbly the more jungly areas of the garden.